Over the years, we have developed a strong distributor network. However, there are still areas where we would like to increase our distribution coverage. Designed for application on gasoline and LPG engines (incl. alusil and nikasil coating) of passenger vehicles and light trucks with mileage less than 50 000 km, (incl. condition after overhaul). Where to buy? Buy ATOMIUM online NOW! Tribotechnical Compound Atomium ACTIVE Gasoline is designed for application on gasoline engines and LPG engines (including alusil and nikasil coating) of passenger vehicles and light trucks with mileage less than 50 000 km, (including condition after overhaul). Precautions: Not harmful if applied correctly. In case of a contact with skin remove the material wash out with warm water, and then wash again with soap. In case of contact with eyes wash out eyes with large amount of water. In case of swallowing consult a doctor. The 1st stage: Add Lubricant Composition Atomium ACTIVE Gasoline to the working engine oil through the oil filling neck (see the graph for calculation), then run the car till the next regular oil replacement (but no less than 1000 km). In case of a significant oil contamination (identify by the colour of the oil on the dipstick or oil spots on filter paper) start the second stage of treatment immediately. Recommendations (after the 1st Stage): Change the engine oil; Replace oil and air filter. The 2nd stage: Add Atomium ACTIVE Gasoline to the new engine oil (see the graph), and then run the car in a regular mode till the next oil replacement. Before applying Atomium ACTIVE Gasoline shake the can thoroughly until natural sediments (active components) are totally dissolved. 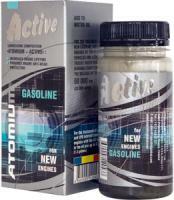 Apply Atomium ACTIVE Gasoline through the regular oil filling neck of the warmed-up engine. After applying Atomium ACTIVE Gasoline the engine should work on single turns (at idle) for 5 min. and then run for no less than 20 min. in any mode (regular operation). It is not recommended to apply the Lubricant at existence of mechanical breakages of parts and assemblies. Atomium ACTIVE Gasoline is compatible to any type of motor oils and doesn't change their properties. For providing continuous level of engine protection it is recommended to apply Atomium Regular at 30 000 - 40 000 km after the complete treatment with Atomium ACTIVE. After 100 000 km to repeat the treatment with Atomium ACTIVE Gasoline Plus is recommended. For turbocharged engines and forced engines the re-treatment is recommended after 50 000-55 000 km. To achieve the full level of protection the treatment of all vehicle parts is recommended, such as transmission gears, hydraulic power steering etc. Provides possibility of short-time run under oil starvation conditions or when oil (oil pressure) is completely lost.